We recently announced a new integration with Ellie Mae’s Encompass®, providing a third party origination (TPO) solution for our users. The new integration streamlines pricing and offers a centralized, secure web portal for lenders and third party originators to collaborate throughout the loan process. The integration allows for lenders to transmit proprietary pricing from Mortech for distribution of both initial and intraday rate changes, while also including base rates, SRPs, LLPAs, and layered profitability. While there are several practical reasons to utilize this integration, we wanted to show some concrete, statistical reasons why and how this TPO integration helps TPO users on Marksman® with regard to bringing in leads and a higher quote volume. Using data from Marksman, we examined some different stats and results between TPO and non-TPO users. As the data above illustrates, TPO users in Marksman process 98% more quotes than non-TPO users. Loan size is substantially larger as well, with TPO users processing loans that are 15% larger than those processed by non-TPO users. TPO users also have an average of five more investors than non-TPO users, making for more competitive pricing online for their borrowers. Allowing all of your lenders to view pricing online, manage borrowers, and submit locks directly to secondary desks all from a single page within your LOS are all reason enough to utilize this new integration, but the statistical advantages of processing larger loans in a more competitive setting at almost double the rate of non-TPO lenders may be the best reason yet. Want to learn more? 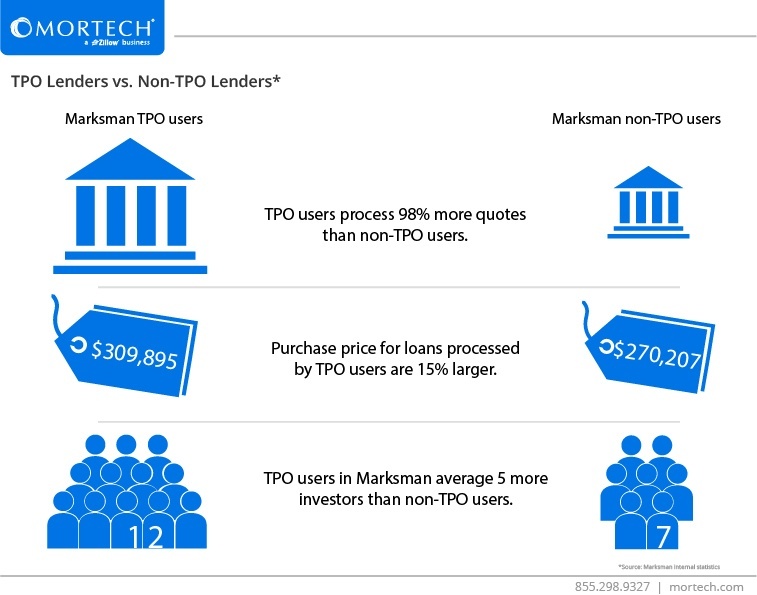 Schedule some time to talk with us more about our TPO integration today, and find out how you can begin using Marksman to bring in more leads, and close more loans.